“Economically prosperous” and “safe” or an “anti-democratic” “protectionist racket”? These were the candid descriptions of the European Union being flung about a packed committee room 17, high in the House of Commons during this week’s Scottish Friendly Brexit debate. Impassioned Parliamentarians locked horns for 60 minutes over the question of whether a vote to leave on June 23rd would have a positive or negative effect on savings. 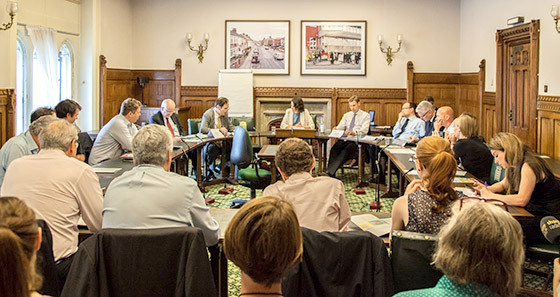 Conservative MP Chris Philp, a member of the Treasury Select Committee, lined up with Labour-Co-op MP Gareth Thomas, who is also chair of the Co-op Party, to make the case for Remain. Arguing for Brexit were the equally strident Conservative Peer Lord (Howard) Flight and Labour MP Kelvyn Hopkins. Chris Philp returned fire, citing a series of statistics to support the Remain case, including that 44% of British exports are headed for the EU. On the trade deficit, he predicted things would only get worse. “When it comes to goods,” he said, “there is a trade deficit between Britain and the EU of £80 billion – but on services there is a £20 billion surplus. The negotiations are more likely to agree a free trade deal on goods. There almost certainly won’t be a free trade deal on services”. With concerns that Brexit would cause foreign direct investment to crash increasing the probability of a run on the currency, Philp concluded that for the sake of the economy he is a “reluctant Remainer”. Debate chair Julia Rampen, deputy editor of Mirror Money Online, brought in Kelvin Hopkins, who wasted no time in sticking the boot into the EU. Underpinning proceedings were the new findings of Scottish Friendly’s regular Disposable Income Index. Neil Lovatt, Scottish Friendly’s sales and marketing director, outlined how Britons were feeling about the referendum – half of households (51.6%) are worried, with young people aged 18-24 most fearful about the impact of Brexit on their family’s finances. More information about the index can be found at Scottish Friendly’s new interactive Insights Hub.